We’re getting much closer now, and its time for me to start offering up my opinions of what will happen in college football this coming season. This article will quickly outline some of the other college football teams outside of the big six conferences. that almost took down top ten team in Oklahoma State last year. The FIU Golden Panthers were an up and coming club last year and they look to build on that success. Middle Tennessee State, UL Monroe and Arkansas State also look to be in contention this season to reach bowl eligibility. The 13 team oddity looks to try and gain some notoriety with a big season from someone in the conference and that team might be Northern Illinois. Returning a very good bunch on the lines, they have a chance to win some games against some big teams. A home bout with Army, and a road trip to Kansas seem winable, while a neutral site game with Wisconsin seems like the big chance to make noise. 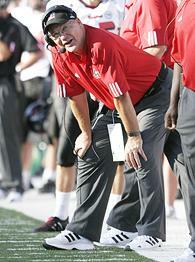 Although I don’t expect an undefeated season, Northern Illinois has the biggest opportunity to make noise in the MAC. Ohio and Miami Ohio seem like two other strong candidates for a great season and will be the biggest obstacles on the other side of the MAC. Expect Toledo and maybe Western Michigan to give Northern Illinois the biggest trouble in the Western Division. With the departure of Boise State the competition in the WAC is up, the quality as a whole is down. Fresno State, Hawaii and Nevada have long been the three other good teams in the conference and all will make the jump to the MWC next year. I expect all three to lead the way this year in the absence of Boise, but look for Louisiana Tech to give them a run for their money as well. The conference should be quite competitive and might come down to the final week. to town this year before TCU leaves the conference should have one final year with good numbers compared to other conferences. Boise State has lost plenty from last year but still returns a few of its key skill players, including QB Kellen Moore. The Broncos face a statisically tougher schedule, but still with only two games that are against teams with similar abilities. TCU loses a bunch too, but should be able to reload defensively. It will be up to their ability to find some offense, that dictates their success in 2011 before they go to the Big East. San Diego State looks to have their best team ever this year, but can they keep it up with the loss of Coach Brady Hoke to Michigan? Conference USA seems to be adding some depth now as this season they could feature six quality teams. Tulsa made some big moves last year and returns alot of offensive firepower. UCF made big strides and looks to win another conference championship. Houston looks to get back to throwing it all over everyone. Southern Miss should be very balanced again, and SMU looks to have their best season in decades.They could have six bowl teams this year and maybe could gain some respect with some big OOC victories against top BCS conference schools. Can Brian Kelly get the Irish back to the old days? Now with four independent teams in the country, BYU should add some flavor to this category. Notre Dame will looking to break out and make strides to becoming a national power again. This year they have one of the more favorable schedules in the country to help them do that. Road trips to Pitt, Michigan, and Stanford seem to be the most imposing games on the schedule, as they get the likes of USC and Michigan State at home. Other than those games they should sweep threw the schedule quite easily. I look for the Fighting Irish to win around 9 games this year and perhaps a bowl game to make it 10. Army looks to take a step back with a very tough schedule. Navy should be bowling again, and BYU will should find decent success in year one of the independent status. This entry was posted on August 8, 2011 at 11:20 am and is filed under College Football. You can follow any responses to this entry through the RSS 2.0 feed. You can leave a response, or trackback from your own site.